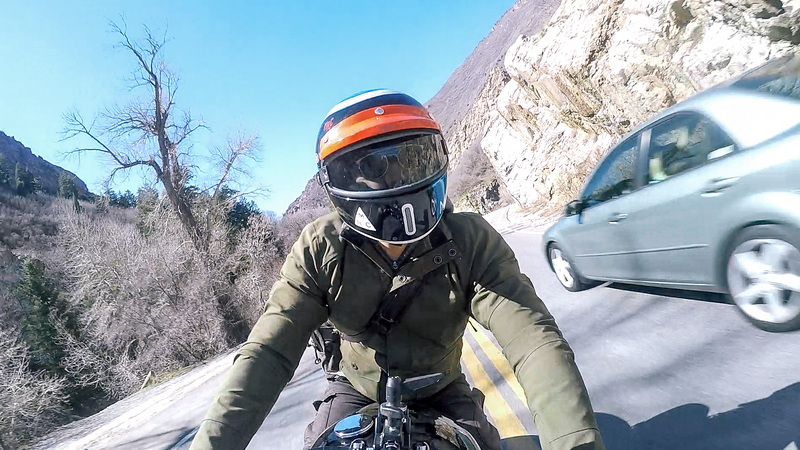 Aether Apparel (pronounced E – ther), based out of California, is a relatively new player in the motorcycle apparel industry. 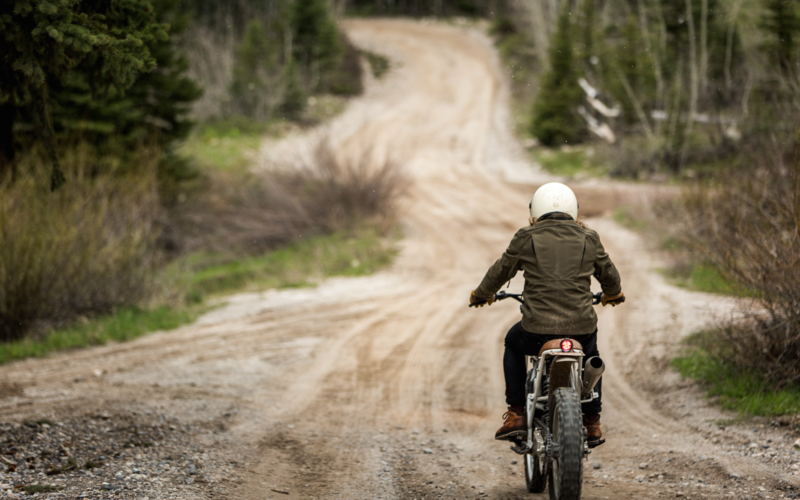 The company makes premium-technical motorcycle jackets and pants, in addition to high quality winter/ski apparel and casual wears. Before I received my Skyline motorcycle jacket from Aether, I was a bit skeptical about the company’s product design. From all the photos I saw, they looked a bit plain, lacking character and functionality, but when I got the jacket one hand, it was completely different than what I expected. I was very surprised on how much better it looked in person when I received the jacket. 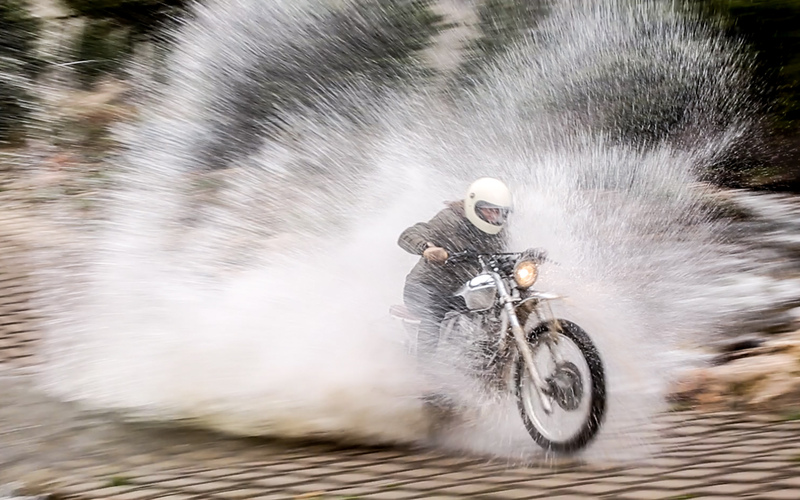 My initial impression of it being ‘plain’ changed to it being minimalistic and elegantly designed, with subtle details that housed very useful functionalities made for motorcyclists (more on functionalities below). 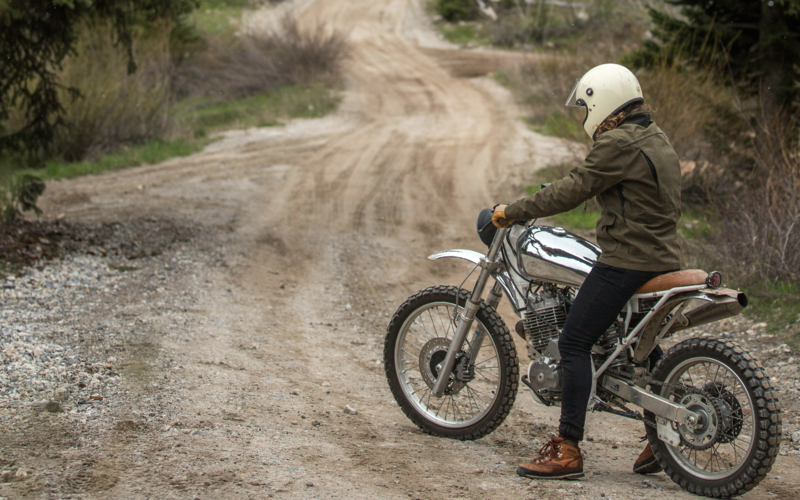 This minimalistic design allows for the jacket to be both a fully functioning motorcycle jacket and also a high quality casual wear when you’re not riding. I received this jacket when it started snowing here, so for most of the winter, I just wore as my daily jacket for work, and not a single soul suspected that it was a motorcycle jacket. Furthermore, it’s pretty surprising how many compliments and questions I got on the jacket every time I wear it. The jacket I have is the Dark Discovery Green color, and it’s just a beautiful color and it compliments pretty much anything I wear. 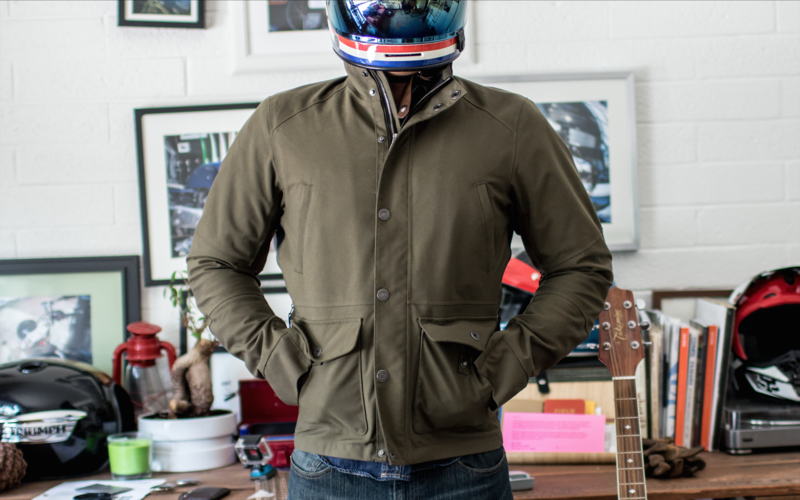 I love this color so much that when Aether sent me the Alto jacket (not a moto jacket), I asked for the same color for it. 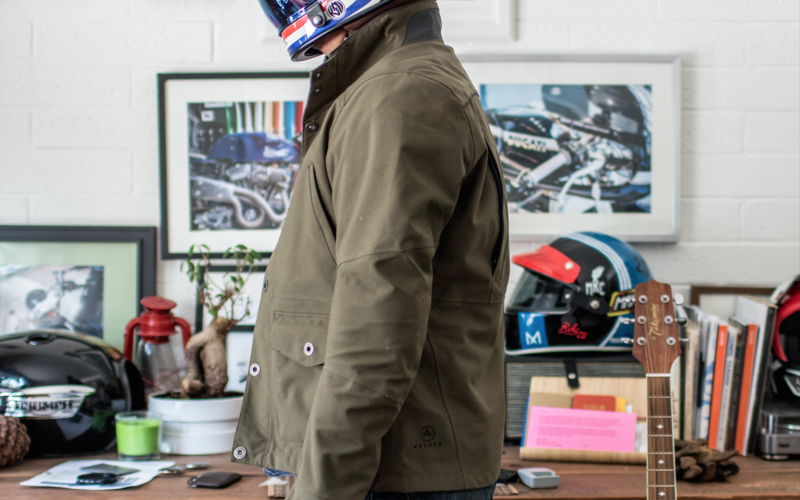 The Skyline jacket also comes in grey (called Graphite), black (Jet Black), and dark blue (Total Eclipes). 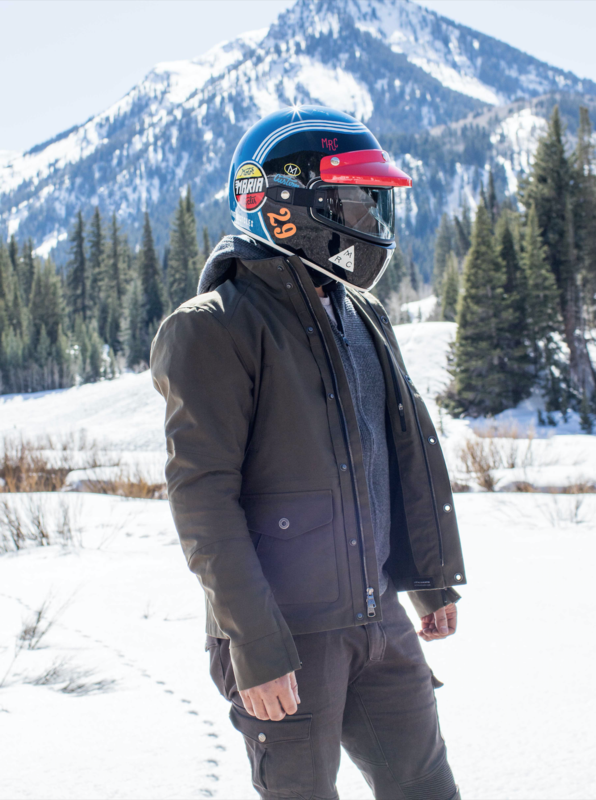 Like I said before, this is a fully dedicated three-season motorcycle jacket. You might be able to wear it in the winter if you wear some warm layer underneath it, but it’s perfect for sping, summer and fall seasons. 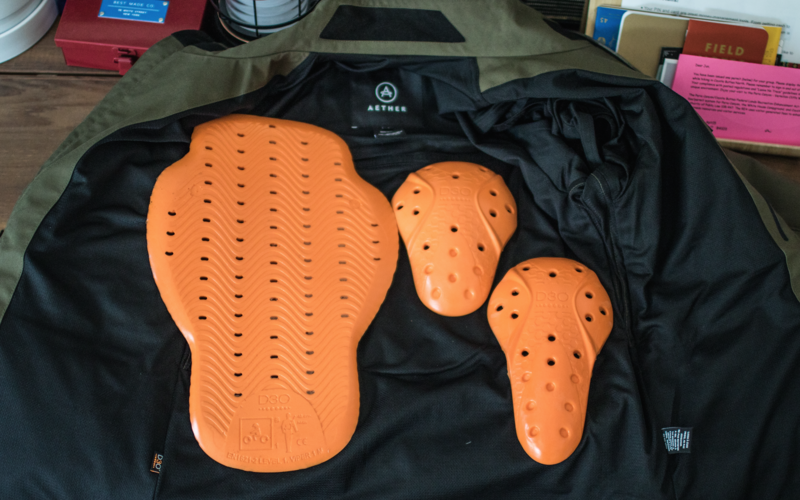 The jacket is constructed with water-proof, 3-layer abrasion resistant Japanese field nylon shell. 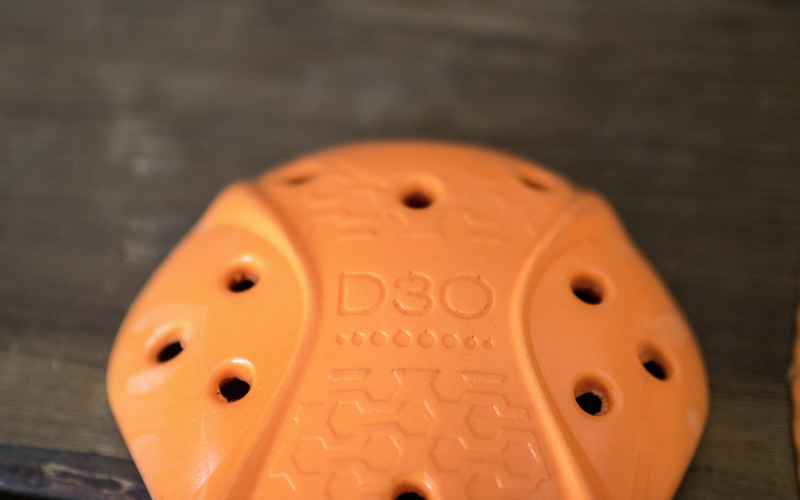 Furthermore, the jacket comes with (yes, included in your purchase) removable D30 EVO XT elbow and shoulder pads, and also removable D30 Viper ST back pad (jackets rarely come with back pads). The jacket also has zipper back and under-arm vents for ventilation, which does a great job in getting the air flow through your body. Also the jacket has zipper wrists to ease glove removal or for allowing air flow and it also has a very discrete but large reflective stipe on the back of the collar. Two of my most favorite functionalities on this jacket are the donut buttons and the hand warmer pockets. 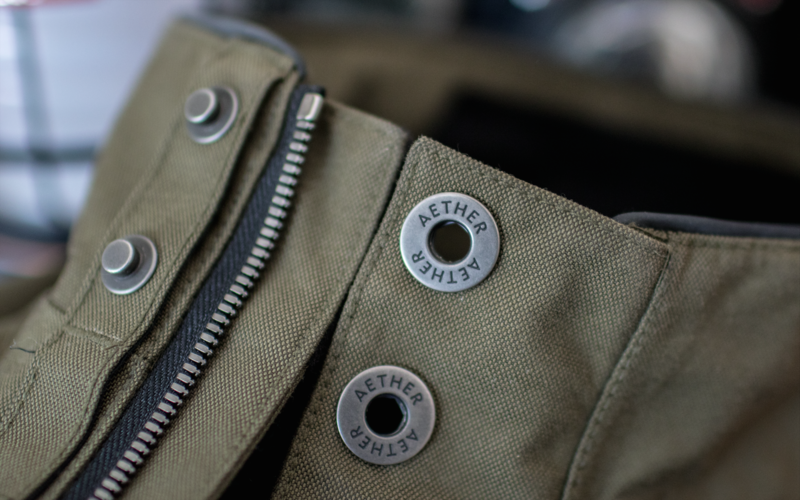 To start with the buttons, Aether definitely had motorcyclists in mind when they were deciding what type of buttons to use, because these buttons are just super easy to locate with your fingertips, and get them to clip-on. I feel like every piece of clothing that has buttons should use what they use. On the other side, I did feel that the zipper handles were a little bit too small to grab onto while gloves on. Now, on the hand warmer pockets. 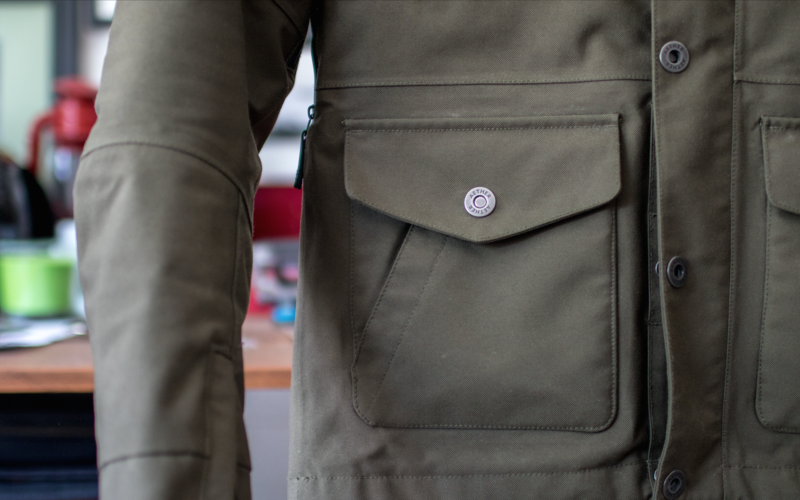 There is a pocket on top of the main side pocket that doesn’t have buttons or zippers, and the opening is diagonal, which is ideal for sliding your hands in. I’m really not sure if these pockets were made for hand warming, but they are perfect for you to roll up your hands into fists and stick them in while waiting at a traffic signal, or when you’re walking around. 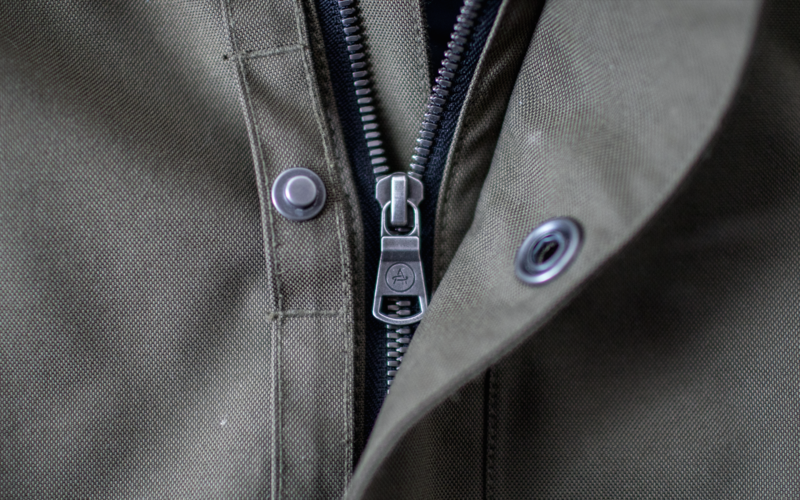 This could seem like a very small detail, but I feel like Aether was very thoughtful in making this jacket and did a great job making it very functional for the users. This jacket retails for $650, which is really really not cheap, especially for a non-leather jacket. Also, I’m not sure if this affects the quality or not, but the jacket is made in China (yea, your $650 jacket is made in China). I’m not exactly sure how to process this. 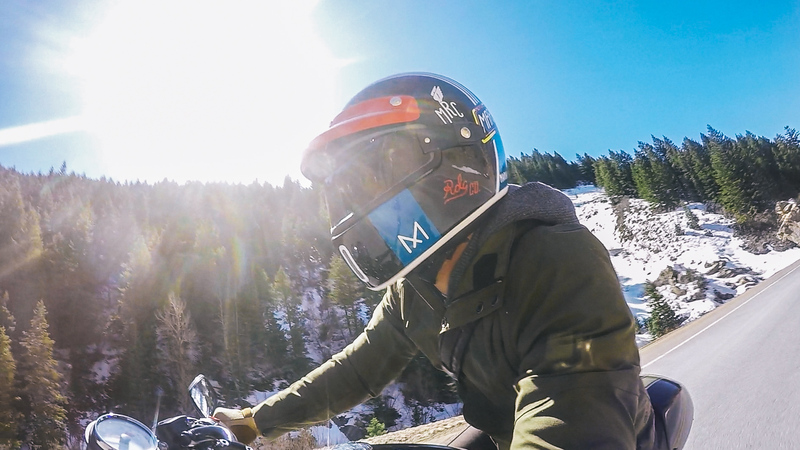 I know I’m comparing apples to oranges, but Shoei’s premium helmets costing around $500 are handmade in Japan. Did China already become a premium manufacturer? I’ll leave that up to you decide. Let’s just pretend that I never saw the jacket’s “made in” label. 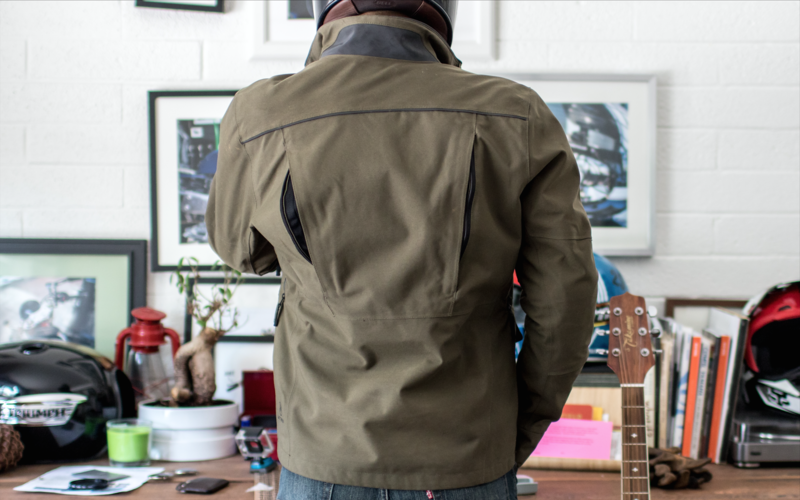 Every detail about the jacket is very high quality, including the fabric to stitching, and its comfort. One thing I’ve noticed is that the fabric oddly wrinkles a lot. 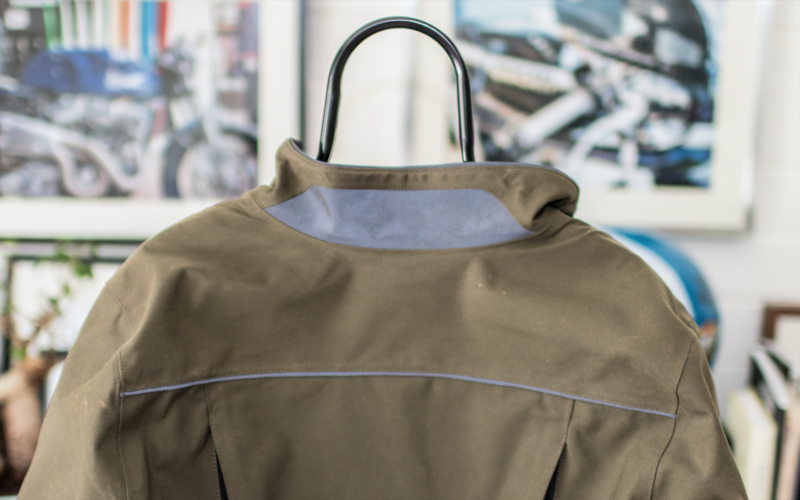 I’m not sure if it’s the abrasion resistant fabric quality, but once your jacket wrinkles, it stays wrinkled. Aether’s overall service is also impressive. The package comes with a return shipping label in the box, so if you don’t like the style, color, or sizing, then you can just pack it back up, slap the return shipping label and send it back. Also, you don’t even need to buy it. 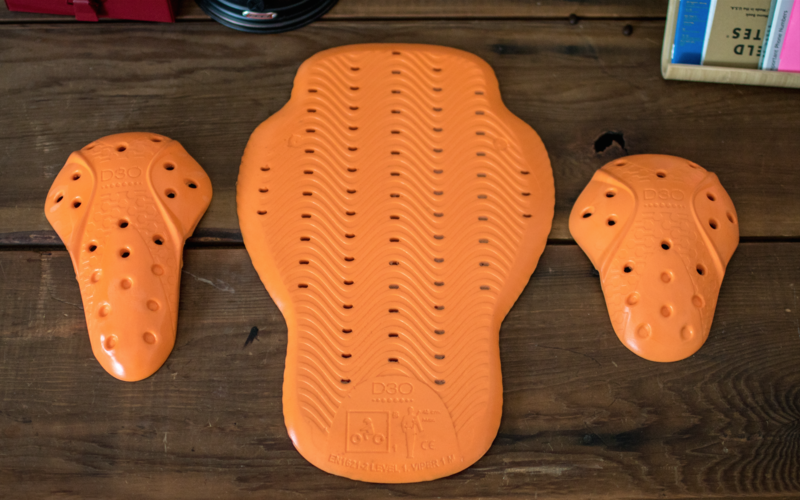 There is a “Home Try-On” option, where if the gear is over $100, they’ll ship it to you for free and let you try it on. If you like it, then you can pay and keep it, or just return it for zero cost. Furthermore, the jacket has a lifetime warranty, and that’s definitely a plus. Aether has a number sizing system, where zero (0) is x-small, 1 is small, and etc. 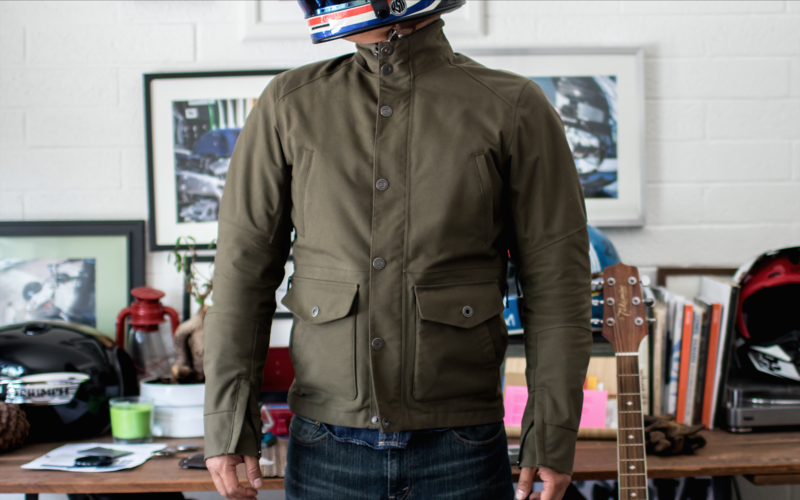 Before getting this jacket, Revzilla review stated that they run a size larger than normal, i.e. if you normally wear a large, then it’s medium for Aether, medium is small and etc. I normally wear medium comfortably, so I got the jacket in size 1 (small), and it fits comfortably snug. I can’t wear any thick hoodies underneath it, but with normal layer, it fits great. Usually there’s no way I would fit in a small. So if you’re an average medium size person, get a size 1 (small), and if you’re in between a medium and large, you should be fine getting a medium. 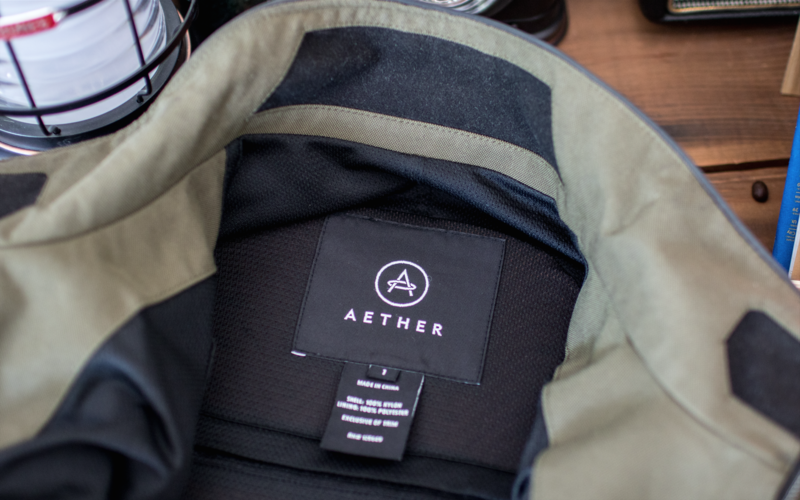 Best thing about Aether is that if size doesn’t fit, it already comes with a return shipping label for free, so you can ship it right back and get a different size. 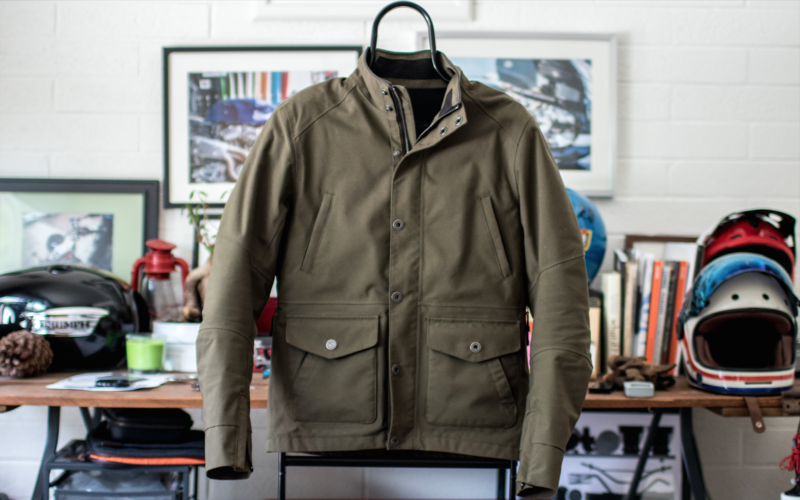 Like I say on all my other reviews, value is such a subjective opinion so it’s really hard for me to tell you whether this jacket is worth your money. Furthermore as a disclosure, I did not pay for this jacket, so it would be that much more unfair for me to tell you to go spend $650 on this jacket. 1) Obviously it’s $650. If that’s cheap for you, then you really should have skipped this whole review. If you really want to know my subjective opinion, just know that this has been and probably will be my primary riding jacket for this season. Yea, so I really like it, and I’m pretty confident that you won’t regret owning one. That’s all I’ll say. #5. Customer service from aether is OUTSTANDING.